Since the inception of Share International magazine, Benjamin Creme’s Master has provided articles to be published not only at the time they were written, but also whenever appropriate according to world circumstances. Indeed, many of these articles seem more relevant now than when they were first published. 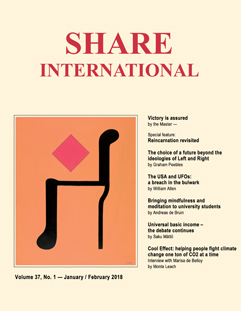 This article, published in October 2005, emphasizes interdependence through the understanding that humanity is One; a fact which must sooner or later be reflected in a reformed United Nations General Assembly which will become the world’s true democratic debating forum, giving a voice to all nations, large and small. Sooner or later, the reality of their interdependence will dawn upon the nations and their leaders. This realization will bring about an entirely new attitude to the problems with which, today, they wrestle, and will lead to easier, and wiser, solutions of these difficulties. A gradual change in outlook will replace the present fierce competition and confrontation with mutual understanding and co-operation. That not all nations will proceed in this direction at the same pace, must be said, but the effectiveness and obvious sanity of the method will encourage even the least sanguine, eventually, to see the benefits for all. Each step forward will cement this process and hasten the movement towards co-operation. In this way, a healthier relationship will evolve between the nations, leading in time to a true sense of brotherhood. Many smaller nations recognize, already, the reality of interdependence but lacking power their voices go unheard. Large and powerful nations scorn such notions, their pride in self-sufficiency blinding them to the truth of their relationship with the world. Man evolves but slowly and needs time and experiment to make significant advance, but precisely in this way do these achievements become stable and permanent. The United Nations is, of course, the forum in which the voice of the smaller nations can be raised and heard. This is only possible when the Security Council, with its arbitrary veto, is abolished. It has outlasted its usefulness and must soon give way to a United Nations Assembly free of the abuses of power and veto. Then will we see the nations acting without restraints imposed by Great Power veto and financial inducement. Those who call loudest for democracy in foreign lands are strangely blind to its absence in the halls of the United Nations. Men must come to realize that the people of all the nations are one and equal, dependent each upon the other. No one nation owns, nor can rule, the world. No one nation can stand alone against the rest. The days of empire and dominion are past. Man is on the threshold of a new understanding of his role on planet Earth. This involves a change in his relationship to his fellow travellers on the path to wisdom and true stewardship of the planet’s bounty. We, your Elder Brothers, will help men to make this change. Maitreya will set before men the alternative to action and the transformation of the world. He will show that without a change of direction the future would be difficult and bleak indeed. He will also inspire men to realize their interdependence, the reality of their Brotherhood. A. On the Day of Declaration He will introduce His group, the Masters. He will introduce a number of Masters: the Master Jesus, the Master Morya, the Master Koot Hoomi and several other Masters. They will come forward later, one at a time, and begin Their work openly as They have been doing privately since 1975. Q. Can Maitreya show Himself in more or several bodies at the same time? Q. Can He exist in more physical bodies at the same time? A. Yes. You have no idea what kind of a man you are talking about! Q. Are all the Masters in non-physical bodies on our planet? A. Many of the Masters on our planet are in etheric bodies; but now about two-thirds of them are in dense-physical bodies and one-third of them are in etheric bodies. Q. How do you think the rest of the world should deal with North Korea? (1) Ignore its threats? (2) Apply more sanctions? (3) Begin trade talks? (4) Offer aid? (5) Which countries are best placed to approach North Korea to attempt rapprochement? On Saturday evening, 7 April 2018, my wife and I went out to a restaurant. A small, elderly Chinese woman, wearing a small backpack, was sitting at the table behind us. After ordering, she got up and began being rather silly and playful with the owner. She then came over to us and began speaking, and although we couldn’t understand her, we got what she meant through her gestures, joyful tone and smiley face. From time to time during her meal, she would get up and visit other tables. She seemed to spread great delight wherever she went. Her manner was very joyful and she obviously liked making people happy. While roaming around, she came to us a number of times, once, pouring us some tea! We asked the owner who she was. He told us that she came two or three times a week, but never at night (it was after 7pm), and he wasn’t sure why she was there that night. It was then that I started to think she might be a ‘familiar’. It was amazing the way she made people so happy, and everyone engaged so freely with her. There were three people at a table beside her, who struck me as ‘special people’ too! At one point, the woman interacted with them in a very warm and loving manner. When she wasn’t going about the place, she ate her food quietly (all the time, wearing her backpack!) Funnily enough, after she had finished eating, she ordered some steamed dumplings and then came and offered us one. As we were leaving, we turned to the woman to say goodbye, and she held her hands palms together in front of her, a gesture which we returned! We left feeling ‘lifted’ in spirit. I have a ‘feeling’ that it was Maitreya (not a spokesperson or a representative), and that perhaps the three at the table were the Master Jesus, a disciple, and Maitreya again! We know there is no way to confirm this, but the reason I think that has to do with the fact that shortly before Benjamin Creme passed, we had accounts of Maitreya appearing as two people at the same time in the same place; more importantly though, that ‘feeling’ has to do with something that happened to me at work the day before (see letter in the Signs section). On 21 March 2018, I received the March issue of the Spanish version of the magazine Share International. When I looked through it and saw the painting of the Last Supper in the Signs section, I thought about taking a photo to put in my kitchen-dining room, but later on, when reading the section ‘Letters to the Editor’, I realized that this picture was related to the story where the music came from. [See ‘Heavenly Music’ in the Letters section in the March issue of Share International, page 22 and related photograph page 11.] I had a firmer reason to put it in the right place from the moment I saw it; it was not only for its music but also for what it represents religiously and mystically, and for its artistic quality. I got my phone that day and took a photo and then went to the photo studio to make a copy. The following day I woke up at about five in the morning, and as I was not sleepy, I decided to watch TV. I put it on mute to read the news and not bother my sleeping husband. Then I heard a low music. I changed the channel to check if it was the news channel because they were broadcasting the news with a music background. As it did not come from the TV set, I sat silently, listening to the music and paying attention. It was very low and very soft, it sounded like a harp, very beautiful. I listened to it for about 20 minutes, then I told my husband and he told me it was like celestial music. I took the photograph on Holy Thursday [the night of the Last Supper], so that is related to the subject of the photo, and that same day I placed it in the dining room. I have not heard that music again, but I would like to hear it again. I think that each new day surprises us with the miracles that occur to people in these times. A day or so later our regular spokesman for the Master Jesus called by; he saw that we have a fairly large screen in the main room facing the road and showing DVDs of Benjamin Creme’s talks (with subtitles). From time to time we have a screen in the shop window, but we haven’t done so for quite a while. The young spokesman asked why we didn’t have the screen in the window rather than in the main room facing the window. “The passers-by can watch the DVD any time they want!” We said we would do it immediately, which we did. A couple of weeks later we half-expected Maitreya’s spokesman to attend a lecture at the Centre; he didn’t appear. However, later that day, 8 April, our regular spokesman for the Master Jesus turned up again and said how pleased he was to see the screen in the window. “Good! And oh, by the way, is the basic information newspaper available now… umm… yet?” This made us laugh because we had just been discussing our plans to reprint that basic information newspaper again! So, it seems he’s keeping us on our toes, in the funniest, gentlest way. In May 2001 I had taken a Dolphin trip near Bimini. I was afraid to swim with them but stayed at the bow of the boat. At one point I could hear whistling from somewhere in the water. It was not the regular sound of the dolphins. (1) Does Maitreya appear in other forms? Was this whistling coming from Maitreya? (2) Also one day the sun was completely surrounded in darkness and there was a light surrounding this circle of darkness. The sun looked so small surrounded in this darkness and it was light over our boat. Do you know what that was? I work at the post office and on Friday 6 April 2018 I had to move a rather large parcel from one place to another. The parcel had some black marker on it which didn’t form any sort of shape other than some black lines. When I put the parcel down and returned to my work position, my co-worker noticed that I had an elegant “M” on my shirt. It was situated on my chest, on the right side, close to the spiritual heart centre! People are saying that they think it may be a Maitreya ‘sign’. PS: After the next night at the restaurant (see Letters, page 21, ‘Confirmation’), I too am convinced that it is more than it looks! Pupils at the Brahmana Palli Public School near Sai Baba’s Ashram in Puttaparthi, India, in March 2006. Photograph taken by D.M. during a visit that she and friends made to the school, where the children were given presents and showed the visitors their rooms. On 10 February 2018, NASA’s Solar and Heliospheric Observatory photographed a huge winged object near the sun. Half a century has passed since the life of Martin Luther King, Jr. was cut short by a bullet, at the young age of 39. Now, as we recall his death on 4 April 1968, the echoes of his dream of universal brotherhood still resound, in stark contrast to a world that appears more divided than ever, begging the question: what have we learned and what has changed since that fateful day? The Reverend Dr Martin Luther King, Jr. is often remembered as the most visible spokesperson and leader for American civil rights, passionately defending the human rights of black Americans and effectively battling to end to racial segregation. Under his leadership the civil rights movement burgeoned into a powerful force for change and influenced the development of many movements for social progress to come. But Dr King’s crusade for social and economic justice was also a global cause; he became a world figure championing human rights movements on many continents, promoting an end to war and expressing the need for what he called, “a worldwide fellowship that lifts neighborly concern beyond one’s tribe, race, class and nation, …a call for an all-embracing and unconditional love for all men, …as an absolute necessity for the survival of man.” To achieve this, he promoted Gandhi’s view of non-violent peaceful protest as the only effective agent of real change, emphasizing that “man must evolve for all human conflict a method which rejects revenge, aggression and retaliation”, with love as its foundation. For his work combating racial inequality through nonviolent resistance, he was awarded the Nobel Peace Prize in 1964. Dr Martin Luther King, Jr. is often remembered as the most visible spokesperson and leader for American civil rights, passionately defending the human rights of black Americans and effectively battling to end to racial segregation. He envisioned the creation of a new society which he called the ‘Beloved Community’, based on justice, equal opportunity, and love of one’s fellow human beings. In the Beloved Community, he said, poverty, hunger and homelessness would not be tolerated because international standards of human decency would not allow it. Racism and all forms of discrimination, bigotry and prejudice would be replaced by an all-inclusive spirit of sisterhood and brotherhood – a moral inclusiveness both economic and social. In a recent article for Project Syndicate, economist Joseph Stiglitz outlines a new report that investigates what has changed since King’s life, recently published as a book, Healing Our Divided Society: Investing in America Fifty Years After the Kerner Report. The product of a commission set up by President Lyndon B. Johnson, the Kerner report investigated the causes of the devastating national race riots of 1967, proposing measures to address them. The report’s conclusions, explains Stiglitz, “described a country in which African-Americans faced systematic discrimination, suffered from inadequate education and housing, and lacked access to economic opportunities.”…. We are on the eve of great changes. The Emergence of the Spiritual Hierarchy, the Masters of Wisdom, makes possible the transformation of the ancient world into the new. How can this transformation be achieved? In this article we will try to present the different stages which could accompany and facilitate the creation of the new civilization. Let us first consider the Emergence as a political act. What is the Emergence? It is the externalization of the Spiritual Hierarchy, which is to say the coming, the return of the Hierarchy to the outer, everyday world. In this context, it is reasonable to question the way in which people, in everyday life, perceive and receive this return. How can we ensure that the “reception” is correct and unfolds under the best possible conditions? To answer this question we need to consider here the idea of politics. What is politics? What constitutes a political act? Politics is everything that relates to the Polis [the ideal city-state], to society, to the organization of that society and life within it. The history of humanity shows us that there are two types of politics: that which aims to separate people and that which aims to unite people. We have always been forced to choose between these two forms. We can observe that man has followed the path that separates, even though it has tried throughout history to establish societies in which they endeavoured to live according to the Laws of Unity. What has humanity lacked that would enable it to live according to the Laws of Unity? Seeking to create unity on a purely material level is not enough. And seeking to create unity on the purely spiritual level is also not enough. Focusing too much on one or the other has led to failure. The future of humanity therefore lies in the correct expression, at the same time and in the same space, of these two polarities: the material and the spiritual. It is therefore important to reflect on the form we give to the New Polis, the new society, if we wish to succeed in living according to the Laws of Unity and fully manifest the Externalization of the Hierarchy. If the esoteric tradition has always recognized that there is no separation or opposition between the material and the spiritual, it remains for us to give form to this recognition on the political level, that is to say, to externalize it. How should we organize society, the Polis, and the group so that both the material and the spiritual aspect can co-operate and grow together? Reflecting on this question should lead humanity to rethink and reformulate the various familiar political and religious paths that they have known until now. If we look at political movements, we can see two major tendencies at work. The first is the development of the material for its own sake, unrelated to the spiritual aspect. This tendency can be observed throughout human history, and has as its hallmark the non-knowledge of and non-recognition of the spiritual. Its name today is “capitalism”, in all its variants. The second political tendency is the development of the material, not for itself, but for mankind. These are all the attempts to pool the resources of a group, known as “communism” in all its historical variants. But to the extent that these attempts were only on the material plane, without knowledge or recognition of the spiritual aspect, they failed, just as capitalism is failing. From this very brief look at political movements, we can understand that the recognition of the spiritual is a necessary condition for the right development of mankind on the material plane – and on the political plane. With the cyclic appearance of great Teachers, humanity has regularly received the stimulus to create the perfect Polis: one in which the development of humanity would find expression on both the material and spiritual planes simultaneously. These stimuli have been concretized into various religions, in all their forms. And just as the various political paths have failed, so too have the different religious paths failed in their efforts to create the perfect Polis. This is largely due to the promulgation of dogmas that have become like material laws and have led to a misunderstanding of the relationship between the material and spiritual aspects of life and, subsequently, between the political and religious fields. The many attempts at “religious communism” (attempts to create the perfect society) have also remained dead letters because they have developed in the shadow of official religious structures, with no connection to the political sphere or any external reality. What has been lacking in the major religions is a proper understanding of what religion is, and subsequently a correct enunciation of politics and religion as inseparable, without either being subordinate to the other…. Becoming aware that we are the Emergence is therefore a very important step for our group in the process of the “reception” of the return of the Hierarchy. Finally, we can say that living the Emergence as a political act, an educational act, and an act of will, gives us the right as a group to choose again. The opportunity to choose, lost for so long, is being given to us again today as a human group. Today, by an act of will, which can be applied in the political field, we can make a conscious decision to work with and for the Light. The Return of the Hierarchy of Masters of Wisdom is the opportunity that allows us as a human group to oppose evil and overcome it by an act of will. It also allows us to claim the connection with the soul and the spirit as a natural requirement that must be expressed in the political structure, at both the collective and individual level. So, one can say at every level from the individual to the collective: “Yes, soul and spirit exist. Yes, I can be in touch with these levels. Yes, I affirm it. Yes, I have the right to affirm it.” And in stating this as an ontological affirmation, I affirm it as a political right, devoid of any dogma; and so, I create the New Civilization. The work that awaits us in the coming years is therefore enormous. It is a question of making this goal an object of discussion so that it can be achieved. It is a question of defining the steps that will guide us towards this goal: redefining the political and religious fields, reorienting them in the right direction at the service of human evolution, and affirming knowledge of the Self as a natural requirement for structuring the political field. So begins a New York Times article on 13 April 2018, describing protests that have resulted in the deaths of dozens of Palestinians and the wounding of thousands more. The demonstrations, which began on 30 March 2018 and are scheduled to be held every Friday until 15 May 2018, are part of a campaign against Israel’s and Egypt’s 11-year-old blockade of Gaza. The protesters also seek to assert the right of Palestinian refugees and their descendants to return to the lands they were displaced from in 1948. The initial idea for a peaceful resistance campaign in Gaza has been attributed to a Facebook post by Gaza activist and journalist Ahmad Abu Artema. Artema “wondered what would happen if thousands of Gazans, the vast majority of whom are refugees, and their descendants attempted to peacefully cross the frontier to reach their ancestral homes,” The Guardian wrote. To avoid danger at the border, organizers of the campaign agreed instead “they would pitch tents and have meals, traditional dabke [folk] dancing, football games and even weddings hundreds of metres from the perimeter,” according to The Guardian. Palestinian political parties, including Hamas, support the movement. “I’m not a spokesman for Hamas,” Artema said. “It’s positive that those people started to believe in peaceful struggle. [Israel] wanted to drag it to violence, they don’t want to confront people. They want to be confronted by a rocket or a missile.” The fact that a small number of people threw stones did not justify live fire, he said. Israel’s violent response to the protests has been widely criticised. The UN and EU have called for independent investigations.